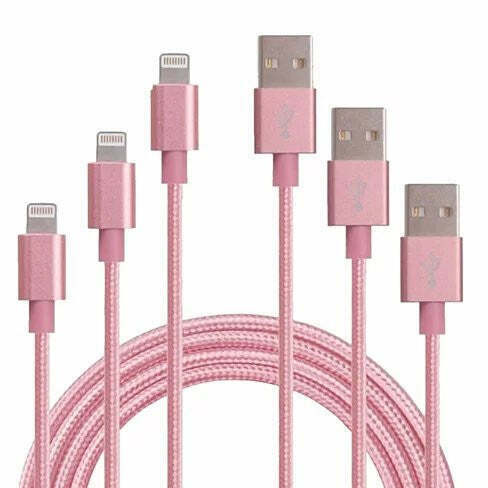 3 to Tango Apple or Android Charging Cables 3ft - 6ft - 10ft All 3 included. 3 cable pack for Apple or Android made from tough Nylon Braided metallic style. 100% Tangle Free use it as needed with 3 lengths you will never bee too short or too long. Each cable made with double reinforced connectors to take the pull and bend while charging you phone or tablet. Fully compatible with iPhone 5/5s, 6/6s , iPad 5 and above and Android Devices like Samsung, LG, HTC using microUSB port. This cable will Charge and Sync Data You get 3 cables 1 x 1 mt (3ft) , 1 x 2 mt (6ft) , 1 x 3 mt ( 10ft appx) Comes in 3 colors you get all 3 cables in same color you choose.